I can do replacement glass, Aluminum or Vinyl windows in brick homes, wood framed homes, mobile homes, etc. 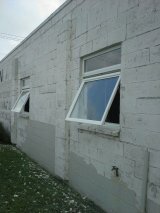 + Click to see New pair of Beige Vinyl windows. New pair of Beige Vinyl windows after removed of old Aluminum Framed pair of windows. + Click to see New Awning windows with Transom Glass. New Awning windows with Transom Glass installed in San Benito business after removal of Steel Casement windows. 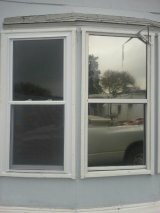 + Click to see New Vinyl Double Hung window and Single Hung Aluminum window. On left is new Vinyl Double Hung window compared to to right side, Single Hung Aluminum window. + Click to see a Before and After of a pair of Jeldwin French Doors. On left was a pair of old wood Double Hung windows that we removed and rebuilt wall then installed a pair of Jeldwin French Doors.